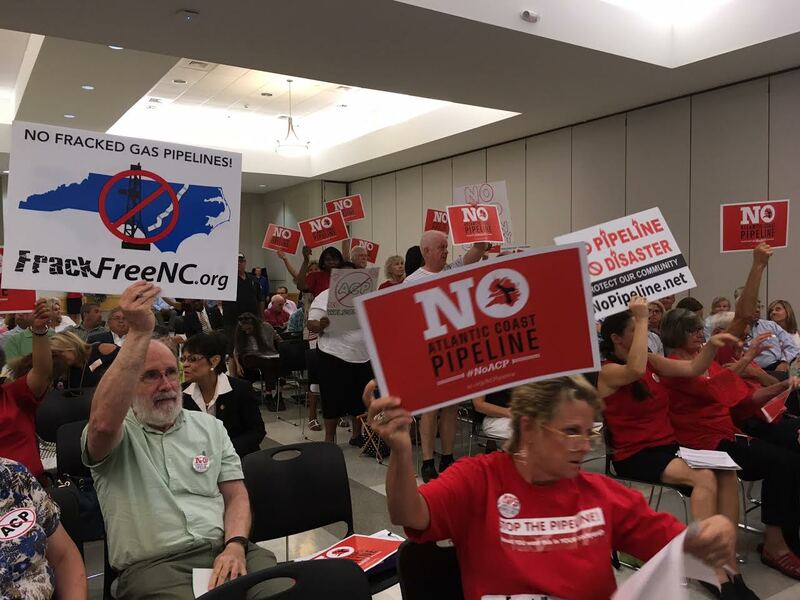 If you missed the recent public hearings on the controversial Atlantic Coast Pipeline, you have three more chances to speak your mind before state environmental officials. The NC Department of Environmental Quality is holding additional public listening sessions about the project, which will cross parts of eight eastern North Carolina counties, including low-income neighborhoods and communities of color. Wednesday, Aug. 16: Northampton County Cultural and Wellness Center, 9536 NC. Hwy. 305, Jackson. Thursday, Aug. 17: Southeastern Agricultural Center, 1027 US Hwy. 74, Lumberton. Speaker registration and sign-in for all three listening sessions will start at 5:30 p.m. The listening sessions will begin at 6 p.m.
After two public hearings in July, DEQ is still accepting written comments on water quality and riparian buffer rules for the ACP through Aug. 19 at 5 p.m. Via snail mail, send them to 401 Permitting, 1617 Mail Service Center, Raleigh, NC. 27699-1617. Written comments may also be submitted by email to PublicComments@ncdenr.gov. Please be sure to include “ACP” in the email’s subject line. The comments will be forwarded to FERC, which has final approval of the pipeline. Until earlier this month, FERC did not have a quorum under the Trump administration, meaning the commission could not issue decisions on any projects. But as of Aug. 3, the US Senate confirmed Trump nominees Neil Chatterjee and Robert Powelson to FERC, filling two of three vacancies. These appointments don’t bode well for pipeline opponents. Chatterjee previously served as energy policy advisor to Senate Majority Leader Mitch McConnell. In that position, Chatterjee helped push for Senate approval of the Keystone and was among congressional officials who opposed US participation in the Paris Agreement. New to the pipeline discussion? NCPW has reported on the potential damage to the environment and to underserved communities. FERC released a draft environmental impact statement and a final version, both of which were incomplete — even at 1,000-plus pages — and omitted or downplayed many key issues.